A boarding school or house in Burmese is called bau2-da2 hsoun2 where the first word is the English loaned word "boarder", and hsoun2 means a hostel, dormitory or a hall. Those in the same boarding house become buddies and they call one another bau2-da2. So, the word bau2-da2 has evolved to mean buddy even if you don't go to the same boarding school. You will hear this usage by the younger generation of Burmese people in this short clip. ဂူဂူး | Gugu and Star International Dance Group. Myanmar Grammar Notes: Burmese question words such as beare2 and ba2 can be either pronoun or adjective depending on how the sentence is constructed. If the question word makes a clear reference to the noun in the sentence, it is an adjective. ja1-pan2 pyi2 ga1 ba2 -- I am from Japan. ta1-yoat pyi2 ga1 ba2 -- I am from China. ka1-la1 byi2 ga1 ba2 -- I am from India. ba1-ma2 pyi2 (myan2-ma2 pyi2) ga1 ba2 -- I am from Burma (Myanmar). pyin2-thit pyi2 ga1 ba2 -- I am from France. Note: Although the word ka1-la1 byi2 is commonly used among Burmese to mean India, the more politically-correct term is just ain2-di1-ya1 without pyi2. sin2-ga1-pu2 ga1 ba2 -- I am from Singapore. a-may2-yi3-ka3 ga1 ba2 -- I am from the USA. ka1-nay2-da2 ga1 ba2 -- I am from Canada. ja2-ma1-ni2 ga1 ba2 -- I am from Germany. yo3-da1-ya3 ga1 ba2 -- I am from Thailand. Some of the old words from the past generations are no longer in use, including Bi1-lut derived from the Hindi word wilayat for England, Yau3-ma1 for Rome (Italy), and Khau3-ma1 for Greece. Names of countries in Burmese pronunciations are given in the table on the left column. It appears that some Westerners who translate Burmese into English try so hard to include the word "you" in sentences such as kha1-mya3 (used by male speaker) and shin2 (used by female speaker). The ending particle word tha1-la3 is almost the same as la3. The extra tha1 in Burmese spoken language appears to come from the ending word dthi2 in the written language, which is the affirmation word. So, tha1-la3 probably expects the answer "yes" more than la3. ba1-ma2 za1-ga3 pyau3 tut la3 -- Can you speak Burmese? nun2-meare2 beare2-lo2 khau2 leare3 -- What's your name? beare2-thu2 leare3 ma1 thi1 bu3 -- Don't know who? Who could that be? lo1 -- particle used in making a report that someone has said "such and such". There has been a lot of controversies and debates as to whether to use the word Burma or Myanmar for this country. Burma is the name known by the western world for several decades because that's how the British called this land as they colonized it for more than a hundred years. Some don't accept the change of the name of the country to Myanmar by the previous military government that they despise. 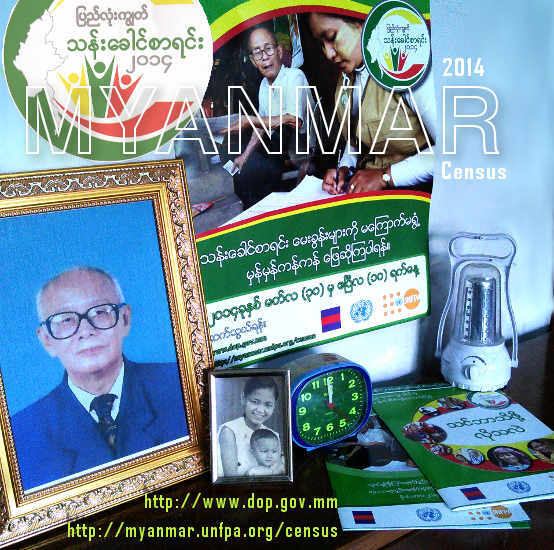 Some argue that the name Myanmar is more representative and inclusive of the ethnic groups, while Burma represents only the main racial group known as "Bamar" who speaks Burmese. Does it really matter? A rose by any other name is still a rose. The word teare3 is used for a place where you temporary stay in your visit. ni3 deare1 hsine2 shi1 la3 -- Is there a shop nearby? Here, you should address yourself as kja1-nau2 for "I" if you are a man and kja1-ma1 if you are a lady as discussed in Lesson 4.
kja1-nau2 ga1-dau1 ba2-leare3 ma1 thi1 ba2 bu3 -- As for me, I don't know what. byi2 leare3 -- has reach what level, number, or state? kha1-lay3 beare2 hna1-yout shi1 byi2 leare3 -- How many children do you have? byi2 la3 -- has reached certain condition or state or not? kha1-lay3 dway2 kji3 byi2 la3 -- Have the kids grown up already? The question word byi2 la3 has been explained in lesson2. hote deare2, shin3-pya1-pyi3 byi2 -- Yes, I have explained it already.